Ingvar consists of a power module and a separate control module. The modules are housed in robust carrying cases, each of which weighs only around 20 kg. In addition to enhancing portability, this two-module arrangement also has the benefit of allowing the power module to be positioned close to the equipment under test, thereby reducing the length of test leads needed, while the control module is positioned for ease of access. Typical applications include primary injection relay testing; circuit breaker testing up to 500 A nominal current and 5,000 A instantaneous current; checking phase, polarity and phase angle of current transformers; heat runs; testing grounding systems; and evaluating the performance of automatic reclosers and sectionalisers. The Ingvar test set is fast and easy to use. Interconnecting the control and power modules takes less than a minute, and the clearly marked control panel is divided into sections as an aid to rapid set up. Predefined settings are incorporated for commonly encountered applications, and any test can be repeated by pressing a single button. A unique I/30 function allows setting up to be carried out at greatly reduced current, thereby eliminating unwanted heating of the test sample, which can lead to erroneous results. A large easy-to-read display is provided that shows current and time, with timing accuracy ensured by the use of automatic zero-crossing switching. The test set can also calculate and display other quantities, including current transformer turns ratio, impedance, resistance, power, power factor, and phase angle. Current and voltage can optionally be presented as percentages of the nominal value, and a second display channel is available to show an additional voltage or current. A further aid to convenience and accuracy is the fast acting hold function that freezes readings on the display when a signal is received by the stop input, when the equipment under test interrupts the test current, or when current injection is stopped by other means. 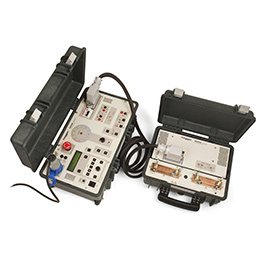 Megger's new Ingvar primary current injection test set is supplied complete with a 3 m cable to interconnect the power and control modules, a 2 m current cable and a 5 m grounding cable. Optional accessories available for use with Ingvar test sets include interconnection extension cables up to 10 m in length, high current probes for testing MCCBs in situ, a current transformer switchbox, and a range of multi-cable high-current test leads.